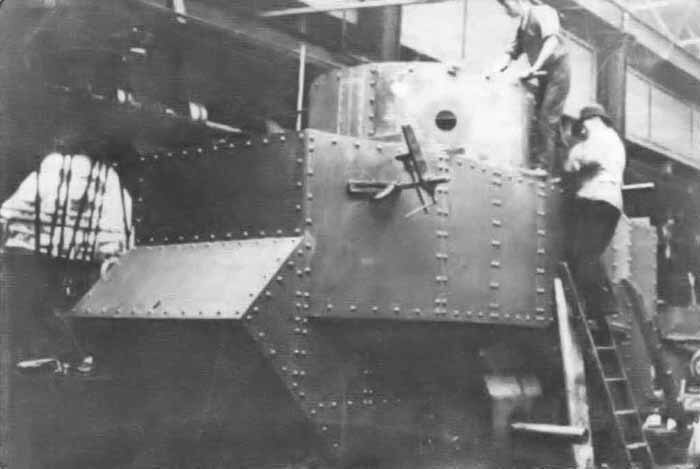 Ernest Dunlop Swinton had made a successful breakthrough in the development of a new combat vehicle, but tank development was far from complete. In addition, after reading H.G. Wells’ books, Swinton modified the concept behind his prototype. However, reality was very different from the story he told. The tractor chassis was not ready to endure the daily stress that mass produced models were intended for. Another problem was that the track chains constantly fell off while in use. They urgently needed an adjustment to the prototype, or a workable alternative. The hull of the vehicle resembled an armoured box. The driving compartment, located in front, seated two drivers with different sets of responsibilities. The driver on the right was to use pedals to operate the engine, operate the lever for switching gears, and control the “tail” wheel with a winch, whereas the driver on the left was responsible for operating the left and right tracks individually, and controlled their speeds using a hand brake. The main problem with the first prototype was the need to deliver a high-quality vehicle within a short period of time. The rear end of the hull featured an engine compartment that housed a 105 h.p. petrol Foster Daimler engine. There was also a fighting compartment located in the centre of the vehicle, but Lincoln Machine No. 1 did not have any weapons. A rotating turret was also developed for the prototype, but it was never mounted. In fact, the “proto-tank” configuration was still in use 2 years after the advent of the French Renault FT 17, which had a rotating turret. The configuration of crew compartments in the FT 17 became – and still are today – the standard layout of a tank. There was heated discussion between engineers and military men as to what armament this new combat vehicle should use. The creators wanted to equip the tank with a 40mm Vickers automatic cannon, but Stanley von Donop, Master-General of the Ordnance, warned that the delivery of a large batch of those guns would take approximately half a year. Needless to say, the war did not simply end. While the engineers and military officers scratched their heads over the vehicle’s specifications, a major operation was underway at the front lines. The combined forces of the United Kingdom and France were preparing to launch an attack near Loos, Northern France. In his book on WWI, the British historian Basil Liddell Hart wrote a chapter about that particular operation in which he dubbed it “an unwanted battle”. Field Marshal Douglas Haig made pessimistic observations about the conditions in the area of operations, saying, “The area is mainly flat and open; it will be exposed to machinegun and rifle fire from both German trenches and fortified villages behind the frontline. A rapid advance will not be possible.”Unfortunately, the French command did not listen. The result? “…That day was a day of tragedy, and there was not a single spark of success to alleviate its bitterness,” says the official British history of that battle. According to statistics, about 60,000 soldiers were killed or wounded during the Battle of Loos from 25 September to mid-October 1915. If the British troops had had tanks at that time, that number might have been dramatically smaller. It was by no fault of the engineers that Lincoln Machine No. 1 was still being tuned; they were dealing with new technology and needed time to properly develop it. In November 1915, Winston Churchill, who had started the Landships Committee, personally went to the front lines as a battalion commander. There, he saw that soldiers severely lacked support and powerful weapons. He tried to inspire officers by telling them, “About seventy tracked vehicles are currently being finished in England. None of them should be used until they all are ready. They can deal with any obstacle and pass trenches, parapets, or ditches. 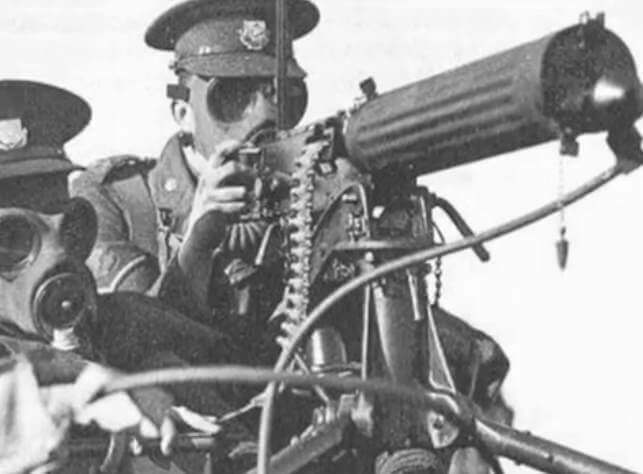 They carry two to three Maxim guns, and each vehicle can be equipped with a flamethrower. The only thing that can stop them is a direct hit from a field gun.” However, history took a very different path. It took almost one year for his claim to come to fruition. By the end of November 1915, the improved prototype was ready. It had earned the title of “Little Willie” because one of the workers found that the vehicle resembled Lieutenant Walter Gordon Wilson, one of the engineers working on it. Little Willie was quite different from its predecessor; its hull consisted of riveted boiler steel plates. Its suspension’s guide rollers were raised also to make it easier to cross rugged terrain. This vehicle was ready for trials, but it was at this time that the fathers of the first-ever tank prototype stopped work on their creation. They had started work on a new project that featured a different configuration (without a turret) and armament placement scheme. According to Swinton, the idea was inspired by “The Land Ironclads”, a story by H.G. Wells. The vehicle was still under a great veil of mystery, when it was given a name. Eustace Tennyson d’Eyncourt, Chairman of the Landships Committee, developed an obsession with secrecy over the promising creation of Swinton and his colleagues. Even British airplanes were banned from flying over the Foster plant while assembly was in progress. However, despite these security measures, there was still substantial risk of an information leak. This necessitated the development of a new codename for the vehicle so as to hide its true purpose from enemy intelligence units. The main stipulation was that there were to be no references to ships, although these were land vehicles. On 4 November, 1915, the prototype was dubbed a “water carrier”, and that name was used until Christmas. On 24 December, 1915, Swinton and Lieutenant Daley Johns from the Committee of Imperial Defence decided to change the designation. “Container”, “cistern”, and even “reservoir” were among the variants considered. Eventually, a short and sonorous “tank” was selected. The cover story was that the plant was producing water tanks for colonies in Mesopotamia. However, the United Kingdom lost its Mesopotamian colonies, so the Russian Empire was chosen as the client for this false contract. Even the precise shape of the hull was known only to the select few. Trials were mainly held at night. One day, the engineers decided that it was time to test the vehicle’s armor, and asked for German shells to test it with. Gunnery practice was conducted in a field not far from the old Lincoln Cathedral on 12 January, 1916. Walter Wilson made a bet with Thomas Hetherington of the Landships Committee, in which the latter bet 50 British pounds on hitting the hull with his first shot. Perhaps due to misjudgement of the vehicle’s position or simply due to poor aim, the shot almost resulted in a disaster. After Hetherington fired the shot, the gun misfired. However, the misfired round was not a dud; it was only delayed. The shell was sent flying straight towards the cathedral. Some of the brightest engineers of the time raced each other to see that the cathedral was intact, and spent two hours searching for the shell with shovels and searchlights in hand. Further trials showed that the armour could take a beating. The final test was supposed to demonstrate the vehicle’s power to its buyers. At first, the demonstration was supposed to take place at Wembley Stadium, but the location was later changed to the Marquess of Salisbury’s mansion. The prototype arrived by rail. A barrier line for the vehicle was constructed under Swinton’s guidance, and the trials were scheduled for 2 February, 1916. The mansion was crowded with the top military and political executives of the United Kingdom. Amongst them were personalities such as David Lloyd George (Minister of Munitions), Arthur Balfour (Foreign Secretary), and William Robertson (Chief of the Imperial General Staff). Lord Horatio Kitchener (Secretary of State for War) himself graced the event, despite his opposition to the project. That was the spectacular first appearance of the first-ever mass-produced tank.